We recommend using a Rove battery for best results, but any 510 threaded, push button style battery should work. We cannot guarantee the functionality or effectiveness of Rove cartridges on third party batteries. ROVE premium C02 oil is passed through a completely solvent-less purification process, removing waxes, chlorophyll, and other unwanted plant materials. Coupled with our strict quality control standards we ensure a great tasting, consistent product testing at 80+% THC. Our high quality stainless steel & pyrex glass cartridge is equipped with a sure-fire dual coil atomizer and a top flow air channel system. This unique chamber ensures excellent taste and flow, while minimizing possible leakage. 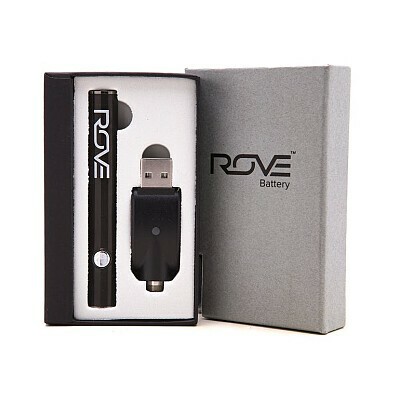 Paired with its long lasting 400mah battery, Rove is always the best choice.